In a competitive industry like the window and door industry, it’s essential for one to stay on top of the game. Renewal by Andersen® knows that; that’s why we stay committed to providing top-quality window and door products for our clients. One of the reasons homeowners trust us is because we continue to innovate and produce premium solutions to common window problems. Our engineers and design specialists work together to create window and door options that can successfully meet and, even exceed, the unique needs of every homeowner. Every window product we install features our exclusive Fibrex composite frame. This highly durable, versatile material is composed of clean, recycled wood fibers, saving millions of square feet of lumber annually. This means Fibrex is one of the most sustainable frame materials there is on the market. Since it’s made by combining two materials, Fibrex brings to the table the natural charm and durability of wood with the low-upkeep properties of vinyl. You can expect this material to last long even though it usually gets exposed to harsh weather conditions. In addition, it boosts insulation, helping keep the ideal temperature inside your home all year round. When you choose our windows and doors for your upgrade, you can enjoy higher energy savings – as much as 25% off of your bills every year! This is because all our products come with our cutting-edge High-Performance Low-E4 glass, which works to keep your interior temperature pleasantly warm during winter and refreshing in summer. Since you don’t have to rely significantly on your HVAC systems to regulate your interior temperature, you can expect lower energy consumption over time. In addition, this glass package helps minimize the effects of harmful ultraviolet (UV) rays, protecting your furnishings from the bleaching effect of the sun. 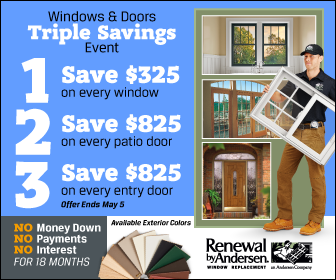 For windows with outstanding features matched with expert installation, choose Renewal by Andersen. Call one of our trusted contractors to start your upgrade! Warranties are an essential aspect of window replacement. In the third part of this blog series, we discuss the warranty coverage Renewal by Andersen offers in detail, so watch out for it!